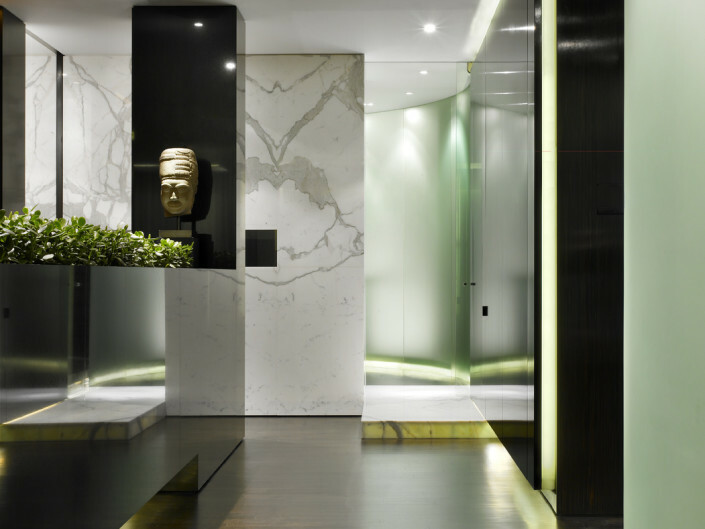 The Client, an itinerant traveler with a penchant for the Far East, requested a design that would evoke a heightened sense of movement and ritual. 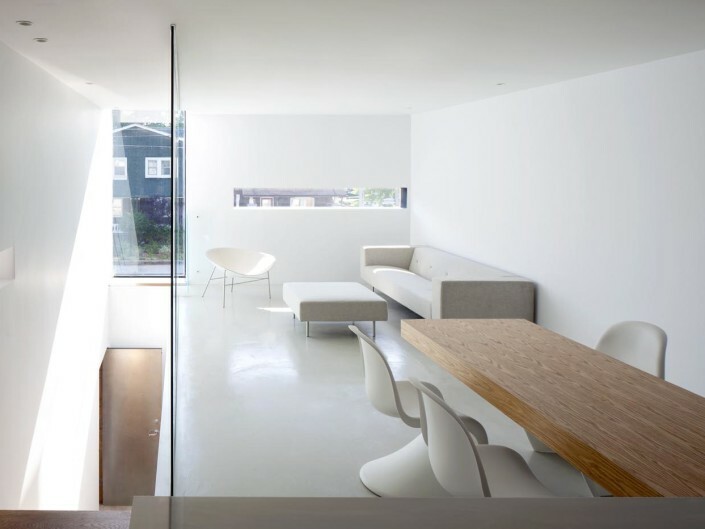 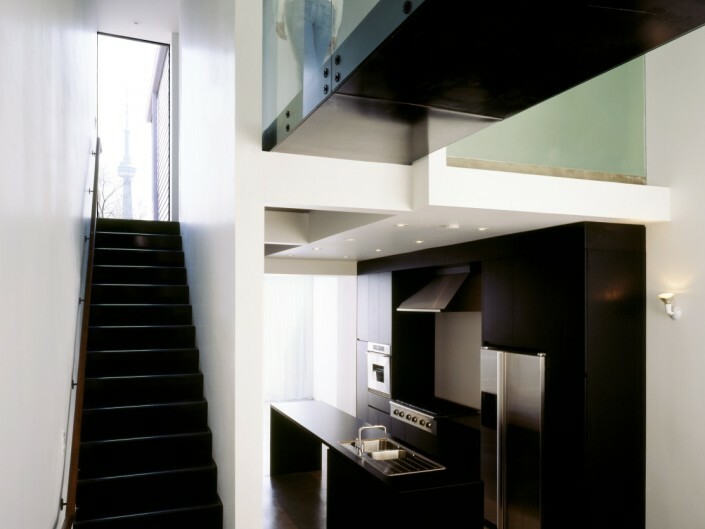 While the living spaces (living, dining, den, kitchen and bedrooms) were to be spare and elemental, the architectural concept was to be focused on the parti the liminal or in-between spaces, emphasizing the journey rather than the destination. 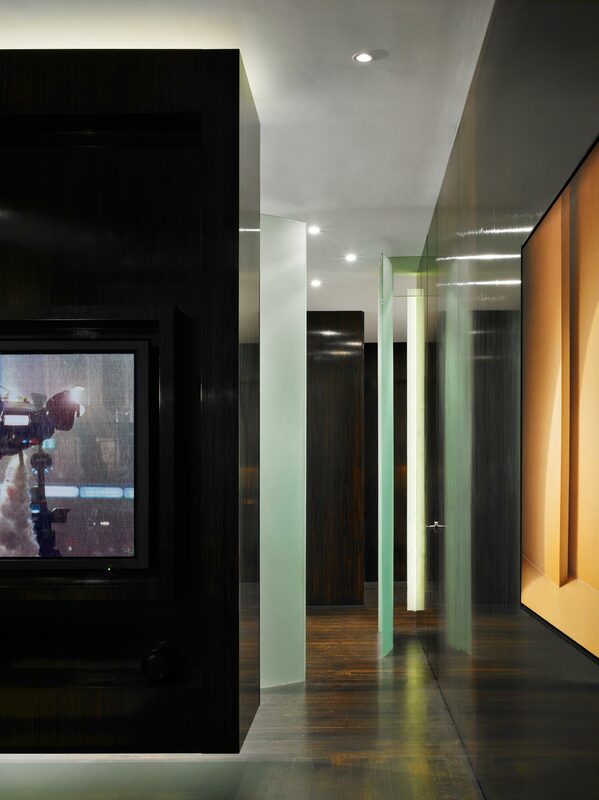 The space was to be overlayed with the Client’s memories, a collage of spatial experiences and materials that could be reminiscent of his favorite boutique hotels in Malaysia and Indonesia; his residences in Paris, France; of negotiating the narrow trails and stone crevices while climbing in Tibet are just a few examples evoked in the main circulation spaces. 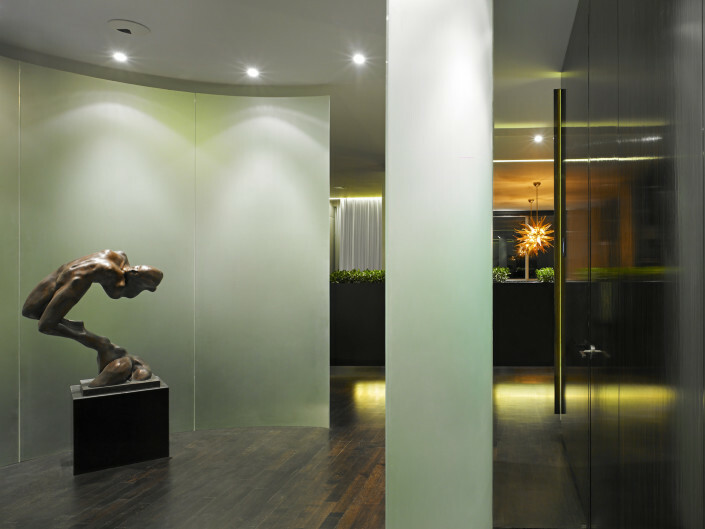 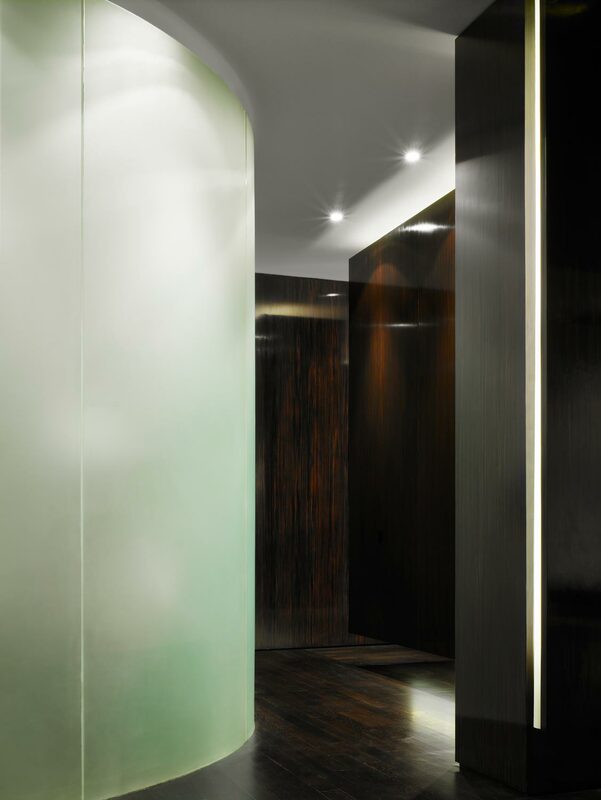 At the centre of the parti is a cylindrical glass rotunda, a modern interpretation of the classical precedent, directing movement and views within and around it with strategically placed openings that lead to the powder rooms, den, guest rooms or living areas. 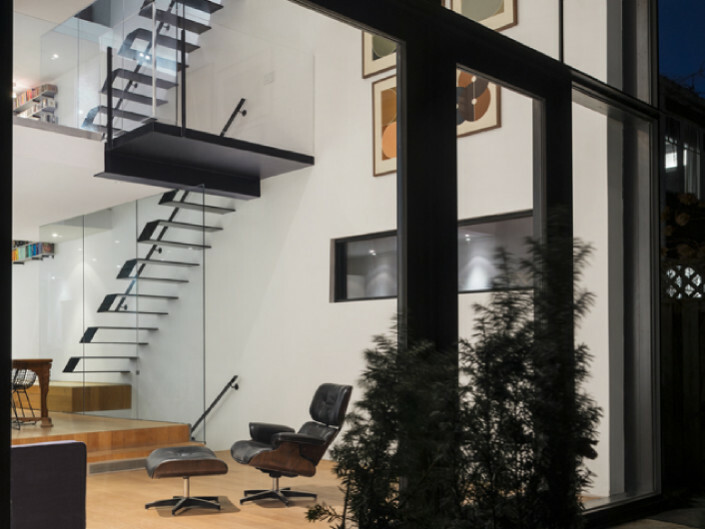 Visible from the living and dining areas, the Rotunda is the physical and metaphorical hub from which the residence revolves. 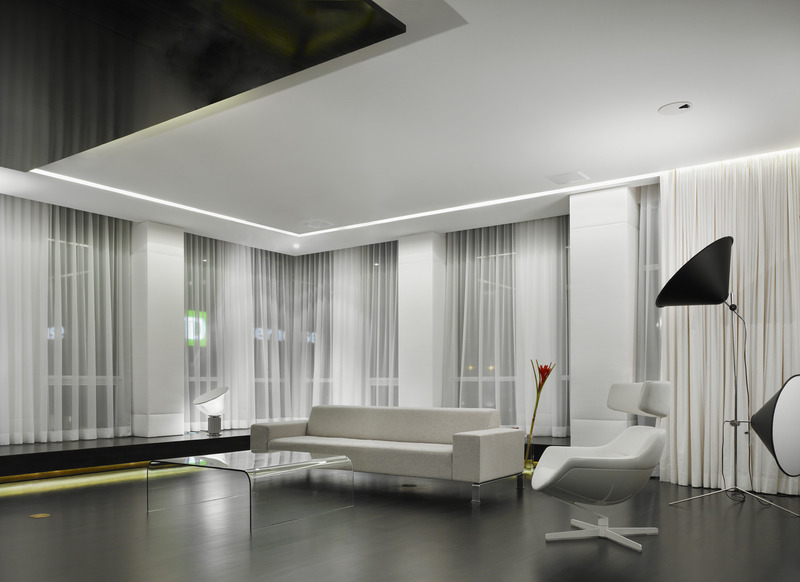 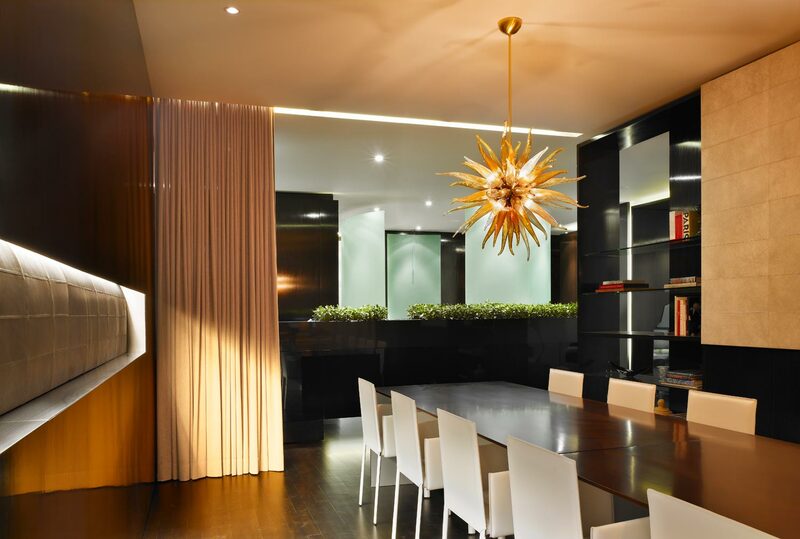 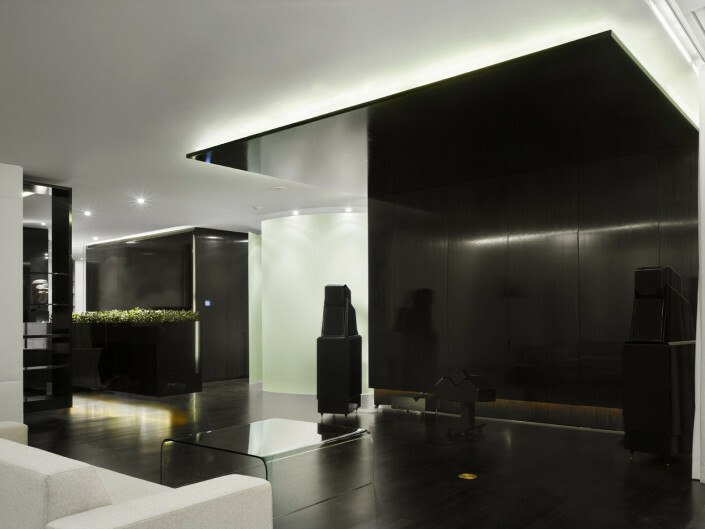 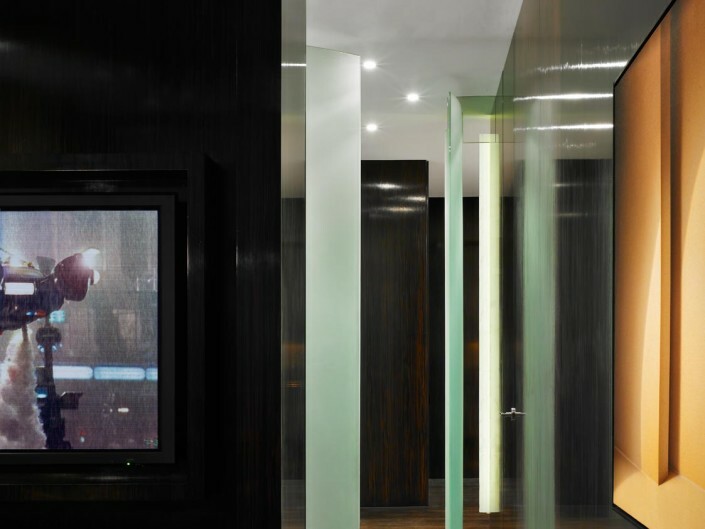 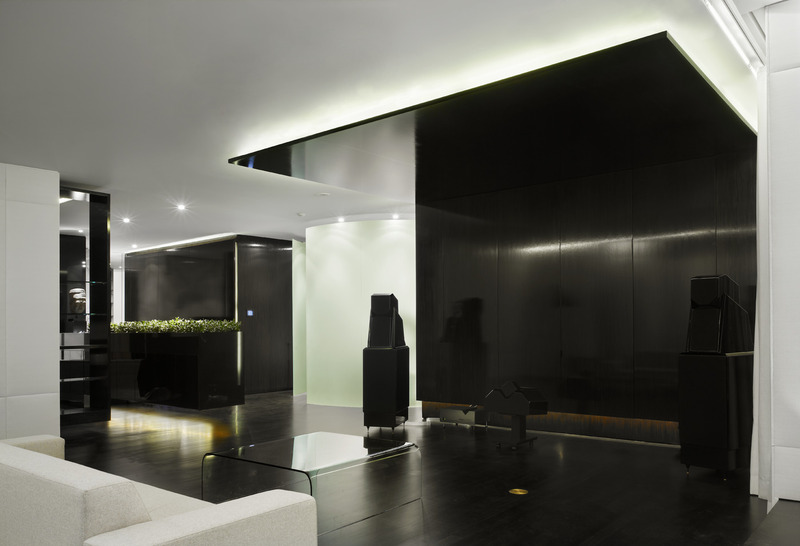 The Client also requested that the space be designed to accommodate his high-end stereo and home theatre systems, and as such the living room could be instantly transformed into a theatre through a “L” shaped custom-designed cabinet that extends from ceiling to wall concealing a large flat screen monitor. 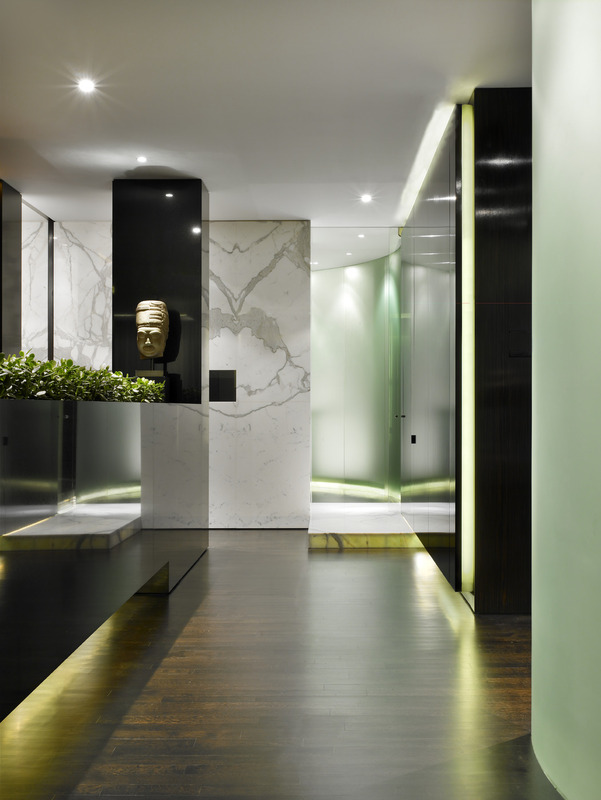 Like a shrine, the bath and lavatory facilities of the master bath is detailed to appear as if hewn from a single block of marble, separated by a one-way mirror that is transparent from the bedroom, reflective when one is at the sink. 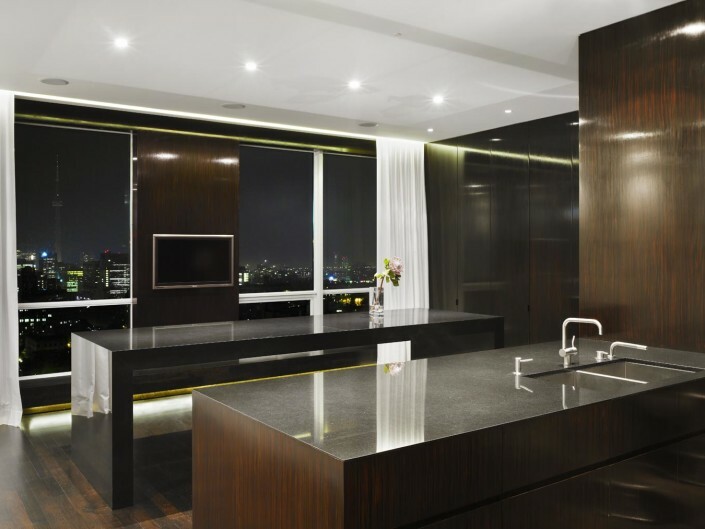 From the Master Bedroom, the act of bathing and washing is ritualized as one engages the washing facility from either side. 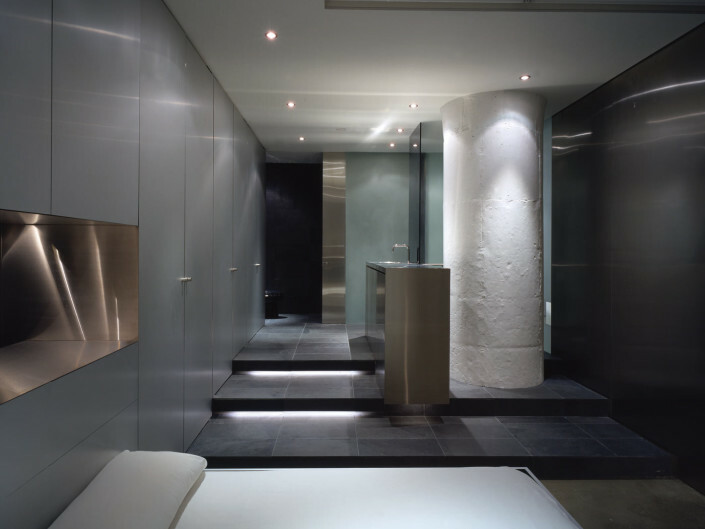 Like a waterfall, two recessed faucets in the ceiling provide the water for the bath. 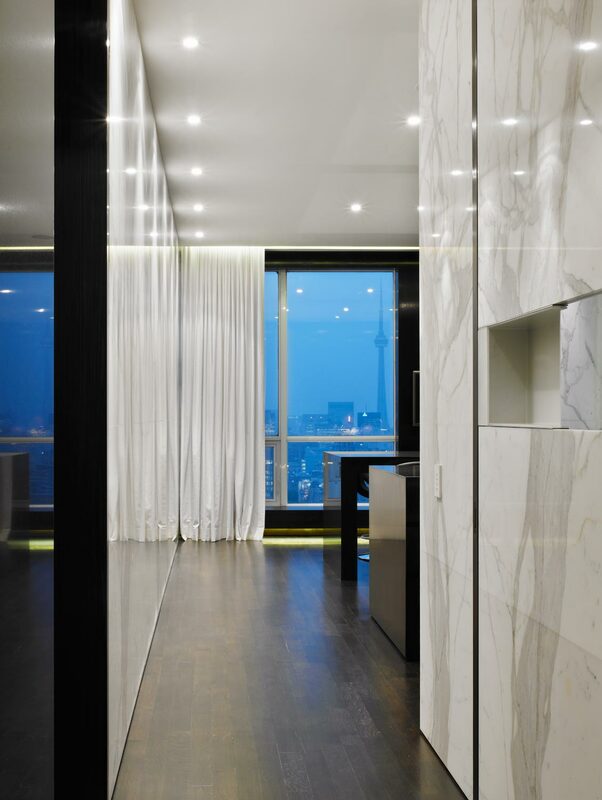 The Client, having an aversion to drywall, requested that only the ceiling surfaces be of that material. 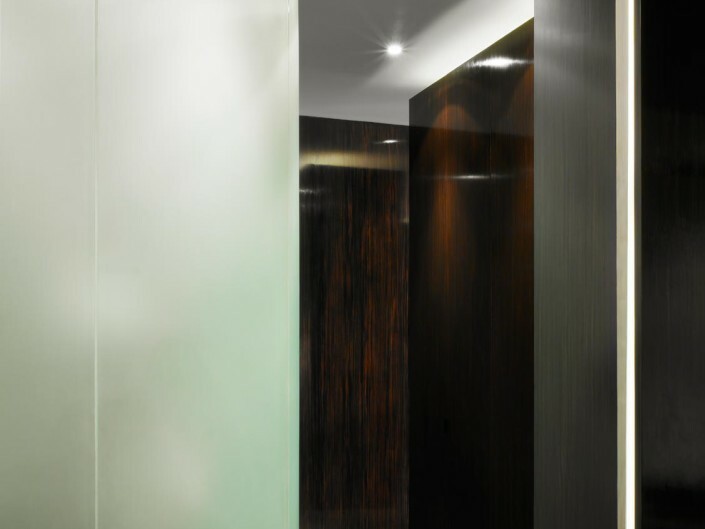 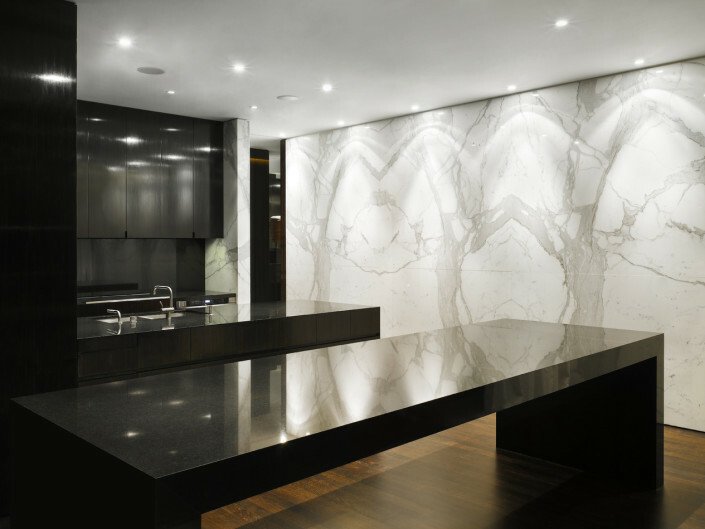 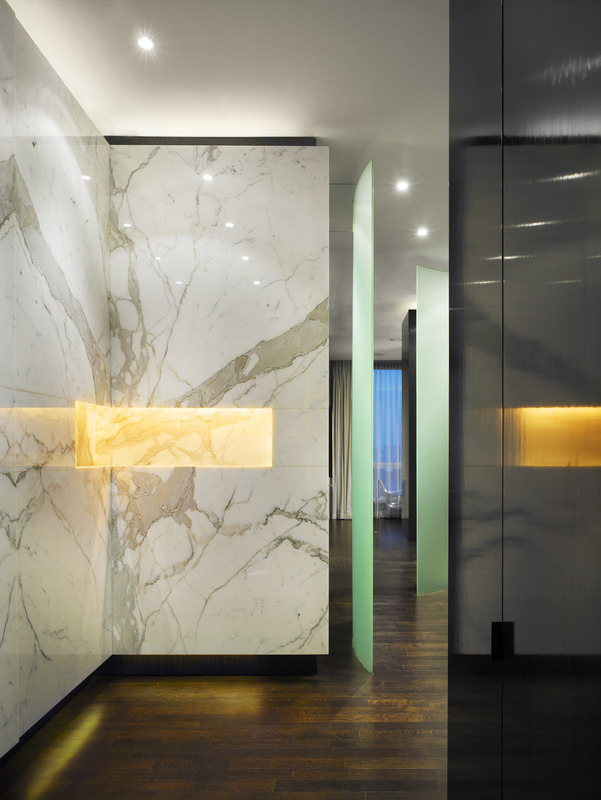 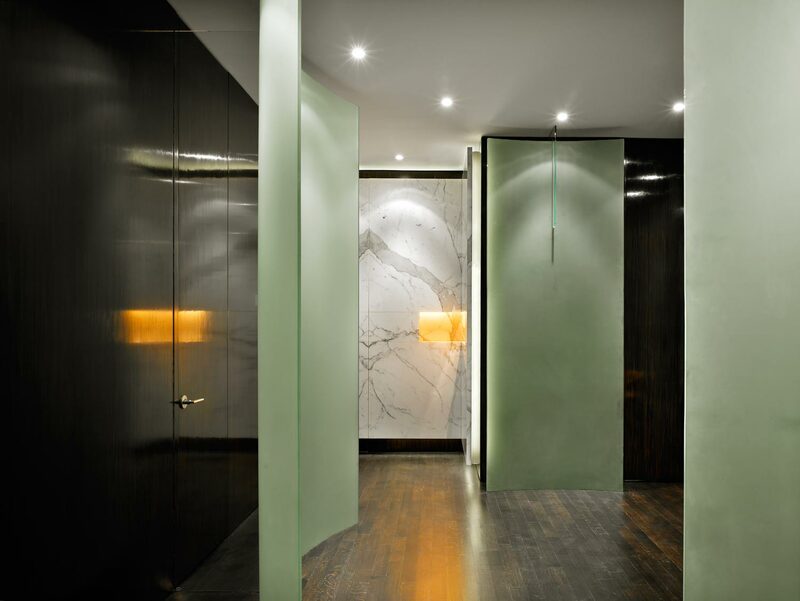 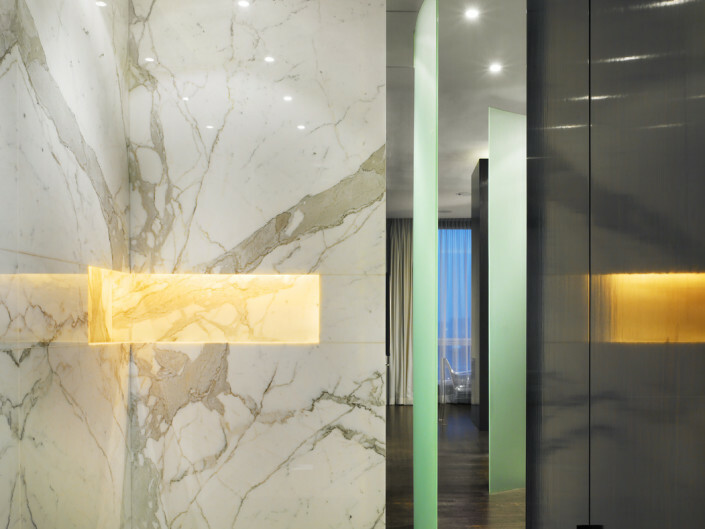 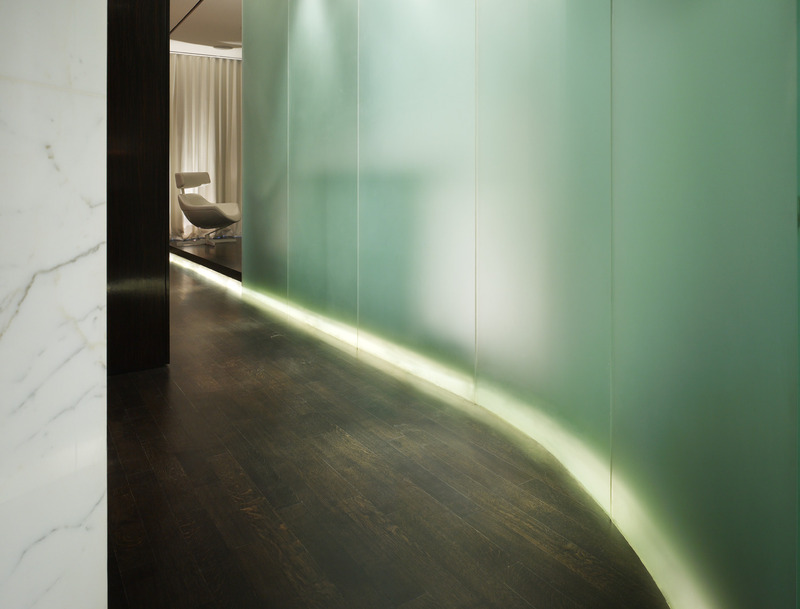 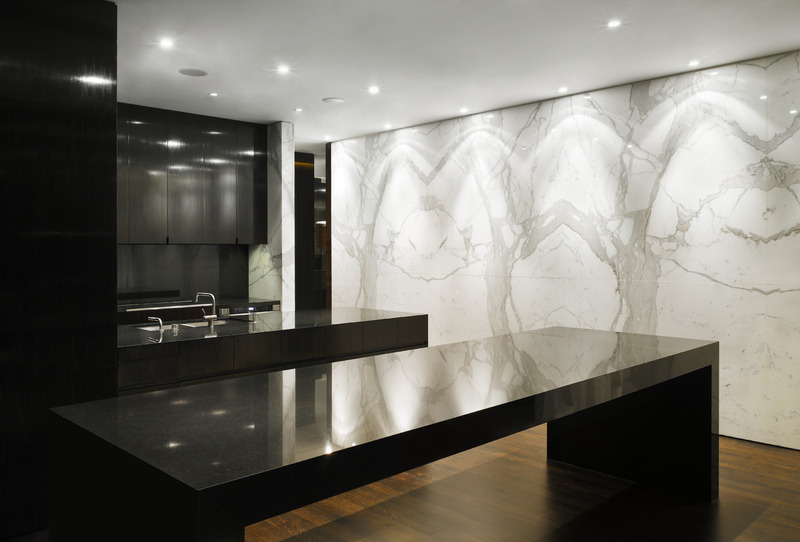 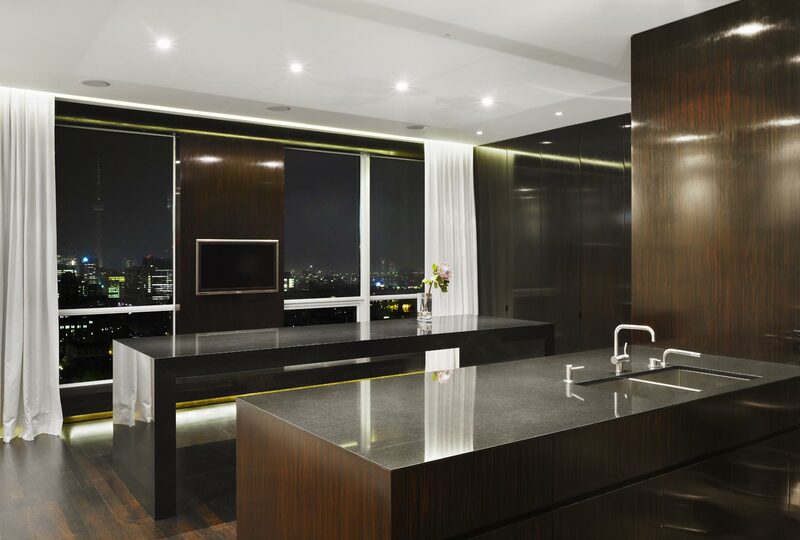 All wall surfaces are composed of fabric, statuario marble and hand-rubbed ebony.